What are the top 8 reasons to have a studio vs in-home newborn photography session? Many new parents are not aware that there are different styles of newborn photography. The two main styles are “Studio” and at-home “Lifestyle” sessions. In addition, (to add to the confusion), some studio photographers will offer to bring their pop-up studio to you for posed newborn sessions. But, does this result in a lower quality session? Why DO studio photographers need a consistent space to achieve their signature style? Which is easier for parents and baby? For this article, we are comparing mid-size to large retail studios (such as ours) to a session experience in a client’s home. Newborn baby photography shoots can be the most precious things in the world that you can only do once. Read up on the hidden benefits of studio sessions from a photographer who has shot both styles for years. Planning always makes things easier. If you want to guarantee a date when your little one arrives, try to schedule it while you’re still in the second trimester of your pregnancy. Most studios allow you to “pre-schedule” and work with you if your baby arrives early or late. Generally, the more “posed” the newborn session is, the younger the baby should be. If, as a mom, you are thinking you will be overwhelmed in the first ten days after birth or if you are having a c-section, a lifestyle session at three weeks or so may be the best thing! For studio portraits, it can be optimal to arrange for photo shoots anywhere between five to ten days after birth. Babies handle even baby led posing the best during the first days of their lives. If the baby arrives early and you notify our studio within 48 hours, I will almost always have at least 2-3 time slots options to accommodate you. We make the booking process simple. If you decide to switch your type of session after baby arrives, we can always do that. What most people don’t know is that the length of lens matters. To shoot indoors with a long lens to create nice backdrop blur requires a significant amount of open space. More space is needed than the length of an average living room or a bedroom. More than likely, lots of furniture would need to be moved to set up a studio in your home. Also, unless your room is painted in a neutral grey or white, light bouncing can throw all kinds of color casts. It is essential to keep indoor temperatures on the warm side, especially during newborn photo sessions. We aim for indoor temperatures of 75-80 degrees depending if the baby is wrapped or unwrapped. Newborns are comfortable with warmth. Cool temperatures can be particularly problematic for newborns who are often taking photographs without clothing. I am familiar with my studio and have a system for keeping it at the best temperature. Most often, moms complain of being stressed to have their home photographed so soon after they have given birth. Most clients desire “clutter free” images. Babies come with a lot of “things”. Our homes become inherently filled with them. Creating a clutter-free environment for your lifestyle session will take some legwork. Your nursery really needs to be completely finished. Most lifestyle photographers also do a series on mom and dad’s bed, so you would want to be happy with how your bedroom is presented as well as your living room. With a studio session, you don’t have to worry about your clutter situation! You just pack a diaper back and come to us! We want our clients to be able to relax at the studio! Enjoy watching your newborn looking adorable from the comfort of our client areas. They include two comfy couches, water, soda… the perfect place for exhausted parents to unwind and even order take-out from a couple of nearby restaurants. There’s not as much relaxing when you’re in your home for a lifestyle session. You may be entertaining visiting family from out of town, feeling like you need to tidy your house, and moving furniture for your photographer so that they have cleaner images and more space. If you come to my studio you can relax, refuel and just enjoy watching your baby or take a nap yourself, which happens quite a bit! You will notice from the body of work on my website that the images are consistent. Depending on the number of people involved, I will use up to four lights and some modifiers that are 6 foot tall. For lifestyle sessions, the amount of window light and time of day must be taken into consideration. Lifestyle photographers will look for the good pockets of light in your house. Perfect studio light at the studio is not even an issue. While we are careful not to create over-styled baby sets, we do have a wide variety of props, wraps, heads, and headbands. All of these are within arms reach, and we have a 500 square foot room just for props. We send you a questionnaire form when you book and pre-plan all of your backdrops before your session. When you arrive, everything is set up! New parents always worry about getting baby out and about during their first weeks and tell me this is often a reason they choose to have a photographer come to their home. There is no need to worry! Our studio is just as clean as your home would be. We take care to make everything as germ-free as possible in our studio. Everything that touches baby is pre-washed in Dreft detergent for babies. All surfaces are disinfected between tiny clients. I photograph one newborn a day and am fully vaccinated for the whooping-cough and flu. I have the space to set up all of my newborn sets before clients arrive. During the session, I move from one set to another eliminating the need for set-up time during your session. More than likely, if a photographer comes to your home of the studio variety, there will only beanbag poses for baby-only images. While I think those poses are lovely, a session with only that style can be a bit boring for my taste. I like variety and I want your session to be easy on all of you! So there you have it! 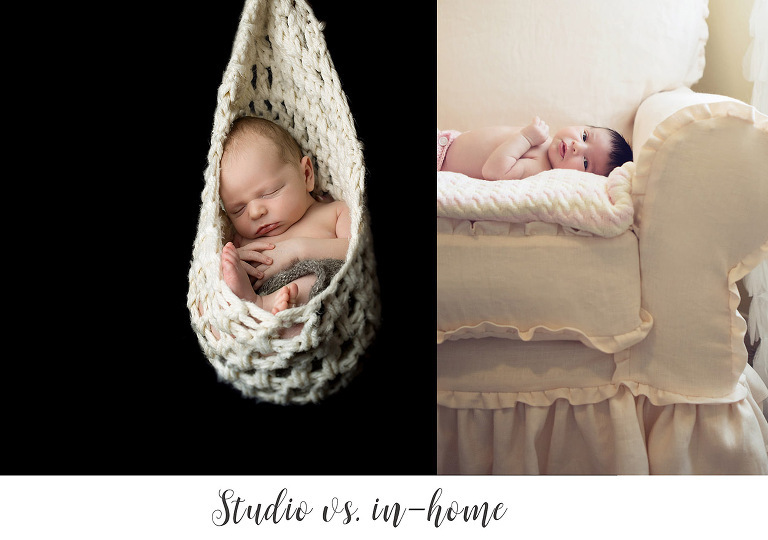 The top 8 reasons to have a studio vs in-home newborn photography session! These are just some of the hidden gems that studio newborn photography has to offer. Moms often think that the “easiest” option is to have someone come to them and in my opinion, but I think it is just as easy to bring them to my way to the studio! We LOVE shooting both styles! 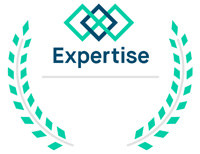 See what our clients have to say about their experience with us.